You must make reservations at least 5 minutes in advance of the time at Max's Restaurant, Cuisine of the Philippines. We are located inside Mission Center with a shared parking lot. We offer a line of Cater Trays, please contact us for details or visit our website to download a Cater Tray menu. We have banquet rooms available for 40 to 100 persons. We can customize your party needs. Please contact our Banquet Officer. Max's Restaurant, Cuisine of the Philippines Las Vegas is located east of the Las Vegas Strip. Situated on restaurant row on East Flamingo Road, the store is conveniently located 2.5 miles from the I-15 freeway and Eastern Avenue, which is a major road leading into Henderson, NV. Max's Las Vegas is the flagship store in North America. It is Max's corporate training center for North American operations. 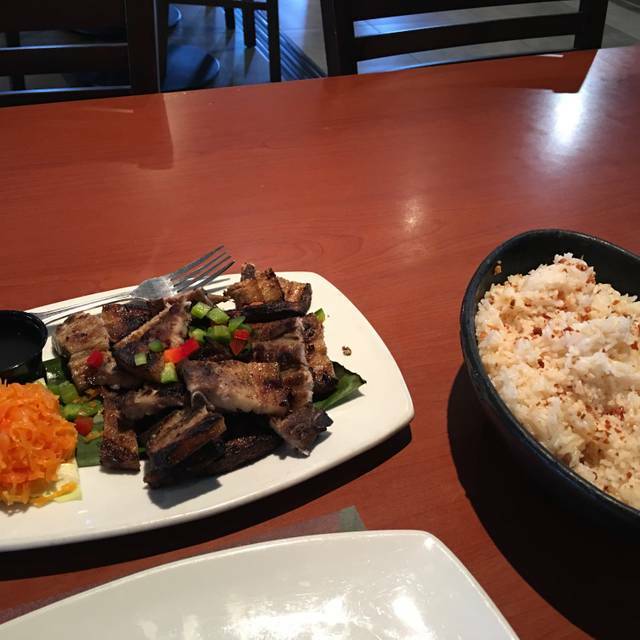 We proudly present authentic Philippine cuisine at its finest to the Las Vegas community. A delicious mix of ground pork and vegetables rolled in pastry wrapper and deep fried. Served with Sweet and Sour Sauce on the side. A Filipino favorite. Battered and deep fried squid rings, served with Vinegar Garlic Dip on the side. A delightful sampler of Lumpiang Shanghai, Sweet Potato Fries and Calamares. Mixed greens with crispy noodles and your favorite Max's Fried Chicken. Served with our special house dressing. 70 year old recipe of tender young chicken marinated in Max's signature seasonings and golden fried to perfection. Jasmine rice deliciously stir fried in golden garlic bits. Generously served with eggs, carrots, green peas and crabmeat. Sautéed with vegetables, pork, chicken and shrimp. A popular dish. Sautéed with vegetables, pork, chicken and shrimp. A traditional favorite. Filipino style spaghetti in a sweet tomato sauce, with ground beef and slices of hotdog, topped with shredded cheese. Brings back memories of home. A blend of egg and rice noodles sautéed with vegetables, pork, chicken and shrimp. A unique dish. Thick rice noodles in a delicious shrimp, squid and ground pork sauce, garnished with garlic bits, ground pork cracklings, green onions and sliced boiled egg. An all time favorite. From our chef's kitchen and freshly made daily. Tender beef shanks and ribs in a flavorful soup, with greens, potatoes and peppercorn. A best seller. A tangy tamarind soup, with your choice of shrimp, pork or milkfish, with assorted vegetables. A must try! Chinese inspired assorted vegetables with shrimp, pork and chicken sautéed in our savory sauce. A popular dish. A mélange of fresh vegetables sautéed with pork, shrimp and shrimp paste. A popular dish originally from the Northern Ilocos region, prepared the Max's way. Eggplant with tomato onion salsa. Served with shrimp paste on the side. Simply delicious. Spicy taro leaves simmered in coconut milk with ground shrimp and pork. White fish indigenous to the Philippines, made flavorful in a vinegar garlic marinade, deep fried, and served with our house relish and Vinegar Garlic Dip on the side. Simple but tasty. Crispy golden brown Tilapia fillet with spicy taro leaves cooked in a rich coconut cream sauce. A favorite choice. Chopped deep fried boneless milkfish with onions and ginger. Served on a sizzling plate. Shredded heart of palm, mixed with vegetables, pork, shrimp and crabmeat. Wrapped in your choice of fresh homemade crepe or fried pastry wrapper, and served with Peanut or Vinegar Garlic Dip. A Filipino favorite delicacy. Fresh, healthy, and deliciously sautéed with wood-ear mushrooms. Served in an oriental ginger sauce with a dash of sesame oil. A good vegetarian option. Tofu cubes with chopped onions and peppers glazed with a special sauce and topped with chili. Pork belly deep fried until crisp and golden brown, yet soft and tender inside. Served with Liver Sauce on the side. Diced crispy pork belly mixed with Max's savory sauce. Served on a sizzling plate. Deep fried pork belly in coconut milk and shrimp paste with fiery spices. A popular Filipino dish. Originally from the Bicol region, prepared the Max's way. Thinly sliced beef sirloin sautéed in onions, lemon juice, soy sauce and gravy. Topped with fresh onion rings. Popular Philippine chicken stew richly marinated in soy sauce and vinegar. Enhanced with the flavors of garlic, bay leaf and whole peppercorns. Garnished with green onions and egg. A well loved dish. Marinated pork chunks braised in vinegar and soy sauce reduction. Made flavorful wih garlic, bay leaf and whole peppercorn. Garnished with green onions and served with diced tomatoes and onions. Diced Max's Chicken and liver, tastily seasoned, mixed with celery and onions. Served on a sizzling plate. A Max's favorite. Premium pork hock simmered in a special marinade and deep fried to perfection. Served with Soy Vinegar Dipping Sauce. A treat! Beef shank and oxtail with vegetables simmered in thick peanut sauce, served with Shrimp Paste on the side. A native delicacy. Delectably marinated pork cheeks, broiled and cut into small pieces, and served on a sizzling plate. Originally from the province of Pampanga, prepared the Max's way. **For kids 10 and under, dine in only. This balanced meal combines a leg quarter of Max's Chicken, Lumpiang Shanghai (egg roll) and choice of rice or fries, and Max's Caramel Bar. Go light and easy with a leg quarter of Max's Chicken and choice of rice or fries, and Max's Caramel Bar. A piece of Max's Chicken (leg or thigh) and spaghetti. Comes with juice or milk and Max's Caramel Bar. Kids love this. A piece of Max's Chicken (leg or thigh), Lumpiang Shanghai (egg roll) and Pancit Bihon (rice noodle). Comes with juice or milk and Max's Caramel Bar. A delightful treat for kids. Half Max's Chicken served with your choice of rice or fries, and soup of the day or side salad. Comes with Max's Caramel Bar. Enjoy a leg quarter of Max's Chicken and a hearty serving of Pancit Canton (egg noodles) or Bihon (rice noodles). Includes your choice of rice or fries, and Max's Caramel Bar. A leg quarter of Max's Chicken, Lumpiang Ubod (heart of palm egg roll), wrapped in fresh crepe or fried in pastry wrapper, comes with a choice of rice or fries, and Max's Caramel Bar. Treat yourself to a leg quarter of Max's Chicken and oriental mixed vegetables sautéed with pork, chicken, and shrimp in a savory sauce. Served with your choice of rice or fries, and Max's Caramel Bar. Beef stew with vegetables simmered in garlic, tomato sauce, cheese and spices. Served on sizzling plate. A savory pork stew simmered in a rich gravy of blood, vinegar, garlic and spices. A unique Filipino delicacy! Crispy pork belly strips with fried tofu in a special soy vinegar sauce flavored with bell pepper, onion and chili. Golden crisp pork ruffle fat served with vinegar garlic dip. An all time favorite! Breaded fish fillet simmered in sweet and sour sauce with pineapple. A blend of refreshing tropical fruit preserves, beans, and milk in shaved ice. Topped with a delicious scoop of Ube (purple yam) ice cream and rice flakes. A classic Filipino dessert. Young coconut mixed with pandan leaf (screwpine) gelatin and tapioca in a rich fluffy cream sauce, with macapuno (coconut) ice cream and rice flakes. Choice of Ube (purple yam), Macapuno (coconut), or Mango. Delicious and mouth watering custard made from egg yolk and milk, topped with caramel syrup. Make it easy for your group and order our set menu - good for party of $10! Max's Fried Chicken, Soup of the Day, Pancit Bihon, Filipino Bistek, Lumpiang Shanghai, Steamed Rice, Soda, Caramel Bar. Max's Fried Chicken, Soup of the Day, Pancit Canton, Pinatuyong Pork Adobo, Chopsuey, Steamed Rice, Soda, Caramel Bar. Max's Fried Chicken, Soup of the Day, Miki Bihon, Lechon Kawali, Kare-Kare, Steamed Rice, Soda, Caramel Bar. Flavored with brown sugar syrup and a hint of banana extract. Served over shaved ice. A well loved refresher. Pepsi, Diet Pepsi, Sierra Mist, Raspberry Ice Tea, Pink Lemonade. A favorite Filipino breakfast, perfect for any time of the day. Tender slices of fried marinated sirloin strips served with garlic rice and eggs*. Comes with a siding of zesty atchara. Marinated boneless milkfish golden fried and served with garlic rice, eggs*, and zesty atchara. Savory pork sausages fried until golden brown and served with garlic rice, eggs*, and a side of atchara. *Contain (or may contain) raw or undercooked ingredients. Let me start off this review by stating that I made reservations for my mom's birthday a month in advance on Open Table. Max's was available for reservation on the website so I thought that meant my group of 8 was set. However when we arrived and I informed them of my reservation, the front host informed us they don't check their online reservations (even though Open Table told me later they've had this option since 2015) and even if they did, they don't honor it during their "busy" times. I informed them that any other night I wouldn't have minded the wait, however I made this reservation far in advance and it was my mom's bday that day, and they drove 6 hours from California without stopping to grab a meal since we were supposed to have dinner here. I told them I made the reservation online, showed them proof that in fact their restaurant had reservations available on Open Table (which they should know about since you ask the website to be put on there), and the host looked confused as ever. After what felt like a long time discussing with the host who said she'll speak to her manager and with another host, I finally just begged them to see if they can set up a makeshift table for our group since we were hungry and had no other plan B that accommodates our large party that late. When the male host returned telling us they're getting a table ready, the original female host pulled him aside and told him that they really should prioritize the other people waiting. That frustrated me the most because I truly believe if you have online reservations available, you should honor it. And although it is up to the restaurant's discretion on which patrons they choose to serve, I've never heard of being turned down for having online reservations and not honoring it because they're "busy". Ultimately we were able to argue our way to a table at eat there but I hope no one else faces this issue. After talking to Open Table, they agreed they've never heard of such a thing as well. The taste is good and the food is properly served in a decent amount. The price is moderate and worth it for the food that you’re getting. My family enjoyed the authentic Filipino food. We would definitely be back once we stop by Las Vegas again. The food was delicious but service from our server Enzo could have been better. My husband ordered a beer when our drink orders were taken but he did not receive it until near the end of our meal. Also, he ordered the pork skewer as part of his entree and Enzo never brought it out either. We had to ask a few servers in the restaurant to check up on our drink and/or wine. Eventually we canceled the pork skewer order because we had an appointment to be at. The food was delicious and our server was pleasant. We enjoyed our experience and we will definitely come back the next time we are in Las Vegas. Great place to eat......go every time I'm in Vegas. Get the Chicken. Went out of the way to go try this place. My wife is Filipino. She was excited. Just didn't match up to expectations. The famous chicken is no better than a rotiserrie chicken from the local market. The authentic dishes we had were bland and just not even close to the home cooked versions we make at family gatherings. The only thing that kept a 3 star rating was their Halo Halo is the best we have ever had. We had a great time. Staff are courteous and attentive. Food is great. I had a reservation at 8 pm, but it seemed everyone else was seated before my group. We didn't get our table until 8:20 pm, which defeated the purpose of a reservation. The food was great. The place was busy so waited a little for the food. Chicken is really good that's always . The sisig that was served to us is spoiled. We had diarrhea after. My mom did not eat sisig she was the only one that was not affected. the waitress was nice and tried her best to serve us . Yung sisig off yung lasa sa pagka sisig. Parang ang layo ng lasa sa sisig. May na lasahan akong luya at suka na parang hindi ko na lasahan sa mga sisig sa Pampanga where the dish originally came from. Excellent food and priced right! Was seated quickly although reservations were not necessary on that night. Service was excellent despite several large groups. Food quality was very good with one exception. The "Halo-Halo" desert had too much crushed ice - by about 50% - which diluted the flavors of the other ingredients. Other wise a very good experience. We'll be back. This was a great find. Excellent menu of a cusine not often food in the US. Good proportions. Outstanding price for Las Vegas. A place where the locals gather, couples and families. been here several times. will go back again on our next trip to vegas. THE RESTAURANT WAS ACCOMODATING , PLACED ME IN AN AREA WHERE THE 2 TODLERS W/ ME DID NOT DISTURB ANYONE. Great if you ate looking for Filipino cuisine in Vegas. Good selection and authentic flavors. As always, Max's didn't disappoint. We love the food, Bangus Sisig on a sizzling platter, Filipino Bistek was tender, and the Pancit Bihon was flavorful. We ended that with a Halo-halo. We left with a gastronomical happiness.